Maria is a 15-year-old sophomore in high school. She is coming in because her parents are concerned that she has lost interest in school, has lost weight recently, and just does not “seem like herself.” Her mother brings her in and says to you confidentially that she suspects her daughter is using alcohol or drugs but does not know what to do. You have asked her mother to sit in the waiting room. 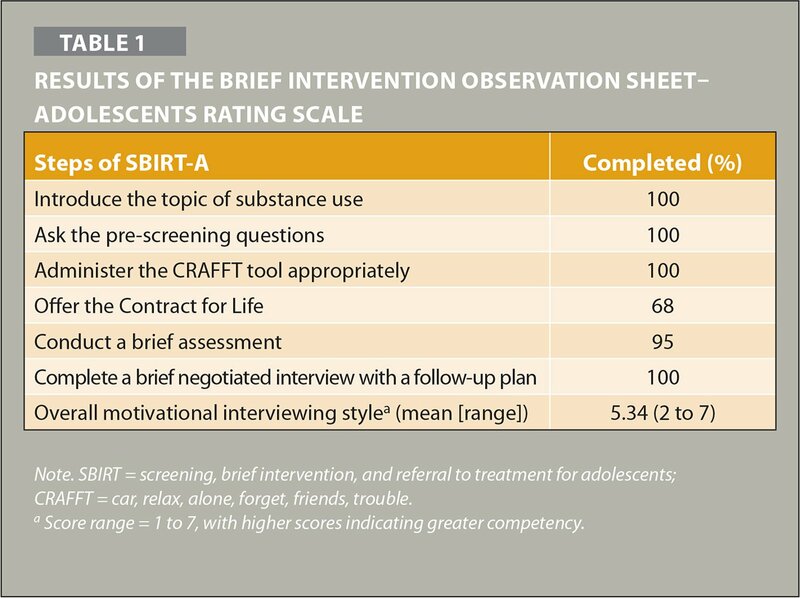 You begin with the screening, brief intervention, and referral to treatment for adolescents (SBIRT-A) opening questions and proceed through the algorithm. Adolescent substance use is a threat to individual well-being while also presenting a public health crisis. National objectives include efforts to “reduce substance abuse to protect the health, safety, and quality of life for all, especially children” (U.S. Department of Health and Human Services, 2013, para. 1). Despite efforts to reduce the use of substances and the associated morbidity and mortality, the most recent National Survey on Drug Use and Health (Substance Abuse and Mental Health Services Administration, 2016) revealed 7.9% (2 million) of U.S. adolescents have used drugs, and 9.2% (2.3 million) have used alcohol. Early recognition of substance use through health care screening is imperative. Emerging literature supports SBIRT-A as an effective approach for assessment and intervention for adolescent substance use (Beaton, Shubkin, & Chapman, 2016). In addition, the American Academy of Pediatrics issued a policy statement endorsing SBIRT-A (Committee on Substance Abuse, Levy, & Kokotailo, 2011) that has since been updated (Committee on Substance Use and Prevention, 2016) and is accompanied by a clinical report that provides guidance on implementing a simplified SBIRT-A approach across different clinical settings (Committee on Substance Use and Prevention, Levy, & Williams, 2016). Mental health clinics offer several potential advantages for SBIRT implementation. Patients with mental health disorders are at increased risk for substance use disorders because of the co-occurring nature of substance use and mental health (Spear et al., 2009). Mental health clinicians are in a position to work with patients on a continuing basis and already may be providing counseling; clinicians can use the information from screening and brief intervention in the overall treatment planning (Spear et al., 2009). Training psychiatric advanced practice nurses and students in SBIRT-A could improve identification and intervention aimed at reducing negative consequences related to at-risk use. Screening an adolescent for substance use begins with prescreening questions designed to determine if the adolescent has used alcohol or other drugs in the previous 12 months. With information from the initial questions, a clinician can praise and encourage those who are abstaining or determine the associated level of risk using a thorough screening for those who report current use (Levy, 2013). The CRAFFT (Car, Relax, Alone, Forget, Friends, Trouble) tool screens adolescents (ages 12 to 18) for high-risk alcohol and other drug use disorders (Committee on Substance Abuse et al., 2011). Depending on the score obtained from the CRAFFT, clinicians can either give brief advice or conduct a brief assessment. Information gathered from the assessment leads clinicians to either a brief intervention and/or referral to treatment (Committee on Substance Abuse et al., 2011). Recent guidelines recommend the type of intervention based on the severity of use (Levy, 2013). Currently, there are different approaches to teaching SBIRT-A, including online training and simulations. The current article shares one approach by a psychiatric–mental health nurse practitioner (PMHNP) program that built upon existing curricular content in substance use, SBIRT, and medication-assisted treatment. Students started by watching the SBIRT-A lecture provided by the National SBIRT Addiction Technology Transfer Center (ATTC) and Institute for Research, Education, and Training in Addictions (Levy, 2013). The lecture covered the impact of substance use on the developing brain, an overview and demonstration of screening and brief intervention, and the art of motivational interviewing. Students were provided an additional lecture created by the Midwest ATTC and university faculty entitled More on SBIRT, which provided additional instruction on screening, motivational interviewing, brief intervention, and confidentiality for the adolescent population. Students were provided handouts and other resources that corresponded with the training. Students were encouraged to practice initially with family, friends, or classmates using the Adolescent SBIRT Algorithm (Committee on Substance Abuse et al., 2011), which provided the steps and sample language to use during the intervention. Simulations using standardized patients (SPs) are increasingly prevalent in psychiatric nursing education. Despite the lack of well-designed research studies, current literature supports SP simulations as a valuable tool for psychiatric nursing students to apply skills learned in the classroom with trained actors who portray real patients seen in the clinical setting (Goodman & Winter, 2017). After completing the SBIRT-A lectures and practicing on their own, students conducted one SBIRT-A intervention with a SP who portrayed the role of Maria, the 15-year-old patient described earlier. During the intervention, a live coach (faculty member) was in the room and gave immediate verbal feedback at the end of the roleplay. In addition, the SP was offered the opportunity to give feedback. At the completion of the SP activity, the live coach completed a Brief Intervention Observation Sheet–Adolescents (BIOS-A), which is a competency rating scale. Students were assessed on their completion of the following SBIRT-A steps: (a) introduce the topic of substance use, (b) ask the pre-screening questions, (c) administer the CRAFFT appropriately, (d) offer the Contract for Life (i.e., agreement to not drive or ride with someone using drugs or alcohol), (e) conduct a brief assessment, and (f) complete a brief negotiated interview with a follow-up plan. Students were also rated on their motivational interviewing style on a scale of 1 to 7, with higher scores indicating greater competency. Overall, students included all parts of the intervention successfully and had moderate scores on motivational interviewing style (Table 1). Themes emerged from the live coach's feedback and rating scale comments. Motivational interviewing skills with adolescents were not as strong as they were with adults in their earlier training; risk reduction in substance use with adolescents, rather than required abstinence, appears to be uncomfortable to use for many students. Overall, students needed to use more open-ended questions, help the teen establish ambivalence, use reflective listening when they hear sustain talk, and decrease overall judgment in their responses. Improvement was needed in fidelity to the steps of SBIRT as well as the delivery flow. Nevertheless, students were able to successfully build upon their previous adult SBIRT training and demonstrate emerging skills to provide SBIRT-A interventions. Training and education on SBIRT for adolescent populations can be readily implemented into PMHNP education providing valuable skills for future practice. There are many approaches to educating students, from faculty-created curriculum to professional online training or virtual simulation; programs should adapt their approach to best meet their needs. Dr. Ellington is Clinical Associate Professor, University of Missouri Kansas City, School of Nursing and Health Studies, Kansas City, Missouri. Address correspondence to Erin Ellington, DNP, APRN, PMHNP-BC, Clinical Associate Professor, University of Missouri Kansas City, School of Nursing and Health Studies, 2464 Charlotte, Kansas City, MO 64108; e-mail: ellingtone@umkc.edu.